Eating out, by its very nature, is almost always a pleasurable way to spend one’s time. After all what’s not to enjoy about someone else taking all the work and all the pressure, delivering a delicious dish and then clearing away too? 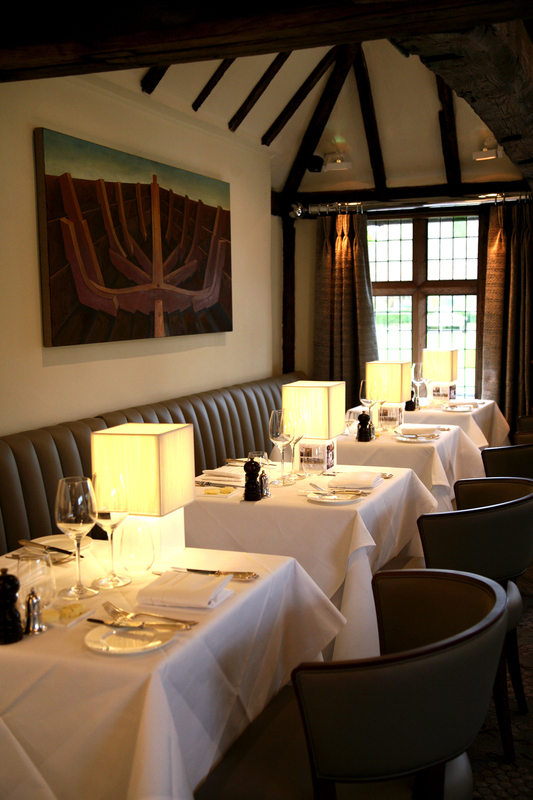 There are times and places for quick bites, cheerful informality and family refuelling but if you’re looking for a special experience – one that is truly exceptional – you should look no further than Le Talbooth. With the most picturesque of riverside settings Le Talbooth at Dedham has been run by the Milsom family since 1952 and for sixty years has enjoyed a fine reputation. Not least because from the moment you walk through the doors of the beautiful historic building the staff make it not just their duty but their mission to ensure that your every need is effortlessly met. Creating a team that can work in this way is no mean feat. Their attentions are perfectly choreographed without appearing rehearsed as their service flows with natural charm and everything moving at the pace that you, their valued patron, would like. And that sympathetic approach is been sensationally achieved. If I’d seen the bold metallic radiators that perfectly echo the curtain poles out of situ and been told they were the new choice for the restaurant I wouldn’t have believed it but Geraldine has very cleverly blended stylish and ultimately modern fixtures, fitting and sumptuous fabrics without detracting from the aged beauty of the property. Working with local experts she has sourced pieces with chic yet quirky individuality – such as the giant champagne corks in the stairwell through to specially designed table lamps casting a warm glow across each dining table. But of course at the centre of all of these very carefully paid attentions is the menu at Le Talbooth and as we read through the choice of starters the flavours seemed to leap from the page; inviting us, tempting us with combinations such as smoked salmon with confit egg yolk and horseradish, quail with wild garlic and cumin roasted scallops. I was hovering between two fishy dishes – almost choosing Colchester crab mayonnaise with wasabi and pan fried squid I opted instead for pan fried skate. I’ve always like the meaty texture of skate and with its accompanying caper and raisin with sprouting broccoli and brown butter crumb I wasn’t disappointed. My husband decided on Ben Rigby venison capaccio with muscat pumpkin tortellini, Parmesan and king oyster mushrooms. The flavours were beautifully intense, particularly from the perfectly thinly shaved shallot crisps, all joining to create a triumphant start. Menus can at times be a little over- whelming; especially when there are so many deliciously described dishes to choose from and that is exactly when the gentle guidance of knowledgeable staff is very welcome. Our host made some suggestions of main courses we might like to try and his first suggestion of rack, loin and braised leg of hare served with parsley root, red currants and bitter chocolate was snapped up by Mr R. He enjoys game but hadn’t knowingly tasted hare before and was in for a real treat. Delicately presented, a work of art on the plate yet packed with rich flavours. Once again I was left deciding between two equally inviting mains, the first of which – breast of Creedy Carver duck with blackened onion puree, shimeji mushrooms and pepper sauce was highly recommended but I chose another favourite – loin of Dingley Dell pork with snails and Anna potato. Pork and snails may be an established partnership but not one I’d encountered and they work very well together. The Anna potato was also new to me and I’m hoping that the recipe might be in the new Milsoms Restaurants cook book ‘Recreate’ – I’m sure my husband could master making a version of it with practice! I surprised myself with my dessert selection. I can usually predict that either chocolate, lemon or strawberries will feature strongly but I managed to veer well away from all three and instead followed another recommendation – a new creation; the banoffee soufflé. How anyone can turn simple ingredients into such a gourmet delight is beyond me. 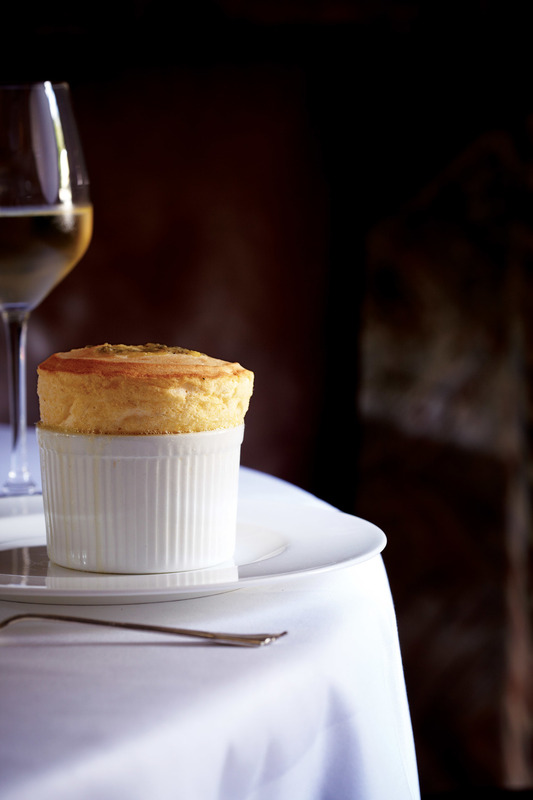 Light, fluffy, overflowing with banana and toffee flavours the soufflé was perfectly partnered with vanilla crumble ice-cream. A generous portion I didn’t manage to eat it all but when I think about it now my taste buds are starting to drool especially for the slice of caramelised banana that accompanied. Choosing his cheese Adrian decided to mix Cornish Yarg (is it really true that it gets its name from the Gray family that created it? Apparently they just gave it their name - but backwards!) with the rich tang of Cropwell Bishop baby stilton plus some wonderfully ‘appley’ Coure De Camembert au Calvados. Call me childish but one of my favourite touches at Le Talbooth is the way that the after dinner chocolates are served. Our dapper waiter approached the table with what looked like a treasure chest but as he lifted the lid the chocolaty aromas spilled out and a very special selection of hand-made chocolates was revealed to accompany coffees and liqueurs. I could carry on waxing lyrical about Le Talbooth and the very special way in which they deliver an impeccable experience but visiting for yourself is the answer. On a warm evening the heated riverside patio beckons for aperitifs or for al fresco dining and of course you could always add an over-night stay at Maison Talbooth, less than a minute’s courtesy drive away.